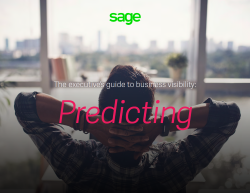 This white paper The Executive’s Guide to Business Visibility: Predicting will help you improve your visibility with tips, best practices, as well as basic steps to help you develop better and more informed forecasts. To succeed in today’s business market, your enterprise should be able to understand what the future may hold—which in in turn gives your organization the ability to prepare, control and attain tomorrow’s goals. If the past is any indicator of the future, it means that businesses are in for challenging times ahead. But what lies in between the past and the future is the present – a time for companies to evaluate current market trends to forecast how they can win tomorrow’s battles by using all the right tools and techniques to do so. This white paper will teach you how to strategically plan for your company’s future by analyzing data, predicting outcomes and executing decisions using a tried-and-true method that focuses on results – in addition to improving your bottom-line.